It really is a shame that the Atlanta Braves grabbed such a big lead in the wild-card race, essentially dictating the Mets' (smart) decisions to trade away their major pieces (non-Reyes division) and play out the string. It might have been fun, if not necessarily wise in the long-term, to see what would have happened had the Mets tried to play this out. History will remember this Mets' season as one of transition, the year Sandy Alderson and company took inventory before taking action, but that does a bit of a disservice to this year at Citi Field: It's been a lot more fun than it has had any right to be. 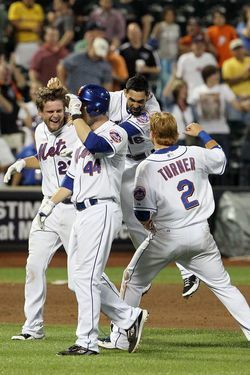 The Mets notched what might have been their most exciting victory of the year last night, beating the Padres 9-8 on a walkoff two-run single by Lucas Duda. The hit finished off a fevered rally by the Mets; they were down by four runs in the eighth inning and came back, the first time that had happened in 195 games. For another of the many examples of why the Mets have such a better television broadcast team than the Yankees — with the Knicks and Mets, all told, New York fans have it pretty lucky, local-TV-broadcast-wise, as long as you only turn on YES when David Cone is working — check out their call of Duda's hit. That'll get one excited on a Tuesday morning. The win bought the Mets back to .500 on a day when Jose Reyes went back on the DL and Daniel Murphy was officialy labeled out for the season. The Reyes injury, in a perverse way, could drive down his free agent price, considering the only real concern anyone has about Reyes is his ability to stay healthy. But that's an issue for a later day. Right now, the Mets, sort of amazingly, have the seventh best record in the National League. Listen, we know the Mets are done — though with 0.7 percent playoff odds! — and that there weren't many fans at the game last night. We know people are trying to come up with reasons to show up. But this team is legitimately fun, and there haven't been many fun Mets teams over the last five years that have been legitimately fun. The Mets' last game of the season is September 28, which means there are 50 days left until the Mets don't play any more games. You're gonna miss it, and them, once they're gone. There might not have been many people at Citi Field last night, but the ones who were there were happy. Kinda makes you wish you had been one of them.